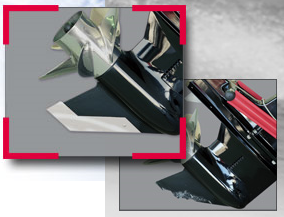 Skegpro protects against ramp dragging, rocks, debris, and submerged objects. Find a model code of your engine under our Model Guide tab below. Made from anti-corrosive, 18-gauge 304 stainless steel, SkegPro protects against harsh marine environments. Its mirror-polished finish creates a custom look and lasting protection. If your model is not listed here we can see if we have a SkegPro model that will fit your particular motor. Measure your skeg following the diagram above and record each of the 5 measurements required. Please either e-mail (info@allboatproducts.com) or call (1-888-309-0990) the information in to us. Also include your type, horse power, and year of motor, along with your name and phone number on your information page. Using a mallet (leather, rubber or wooden), place the SkegPro on the skeg and gently tap on it to get it started. * Depending on motor application, the rear portion of the SkegPro could extend up to an inch beyond the skeg. Using the predrilled mounting hole in the SkegPro as a pilot hole, drill the skeg using a 3/16" drill bit, and install the stainless steel hardware.